Need advice about a specific Subaru Impreza / WRX / Outback Sport problem? Chart based on 225 repairs. 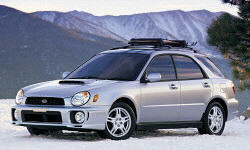 See TSBs and recalls for the 2002 Subaru Impreza / WRX / Outback Sport. Chart based on 185 repair trips. The repair cost chart excludes repairs made under warranty, do-it-yourself repairs, and repair trips that include maintenance. See repairs for all Subaru Impreza / WRX / Outback Sport model years. US $160 Replaced alternator belt, ac/power steering belt, idler pulley. I broke and replaced plastic piece that was part of ac belt tensioner. Idler pulley was preventative maintenance. One of the two radiator fan had a broken fan blade. I believe it was my fault and was a by-product of my previous belt install. US $306 Replaced left front axle shaft. CV boot was spewing grease. Car was in for 90,000 mile service. US $800 Replaced rear catalytic converter and midpipe. Preventative maintenance: replaced rear O2 sensor. US $300 Replaced passenger-side external rear-view mirror. US $80 Vacuum lines became brittle. Replaced all with new t-joints and clips. US $300 replaced center differential with used unit. US $150 Seized waterpump - this caused failure of timing belt. Engine is now inoperative. Update: sold car without this fixed in March. US $2000 Wiring harness was modified by previous owner and is now requires complete replacement. C $1000 Both head and valve gaskets. US $881 Timing belt was old and slipping so produced a burning rubber smell on long drives. A replacement corrected the problem. US $630 timing belt tensioner pulley failed, which prompted a complete timing belt job. US $450 Ignition coil on #2 cylinder was failing, causing misfires, rough running & loss of power, as well as the Check Engine light to flash. Replaced ignition coil and it fixed the problem. 86900 mi Driver side front axle replaced. US $170 Door lock cylinder came loose and fell into door. Repair shop removed door panel and reattached lock cylinder. Repair shop damaged timing belt idler pulley while replacing timing belt. Problem was noticed after taking car on 100 mile trip. Repair shop replaced defective unit at no labor cost to owner. Owner paid for new idler pulley. A/C inoperative. Repair shop replaced o-rings and seals and recharged A/C. US $20 Replaced the a/c belt tensioner pulley. It was squeaking and I was certain of immanent failure. US $30 Lower radiator hose and thermostat gasket due to coolant leak. US $50 Blower motor due to failure of the motor. Motor and ductwork replaced as unit. Bought used hvac unit with cores for $50. Took an hour to change out. 159800 mi Fuel smell on cold days, replaced fuel rail under extended warranty from Subaru. US $120 CV joints getting loose, clunking. Boots busted on both front shafts. US $70 Replaced rear differential mounts. US $150 Leaking radiator, replaced radiator and hoses. US $140 Gear shifter had major side-to-side slop. Replaced shifter linkage. While it was apart worn transmission mount was replaced. 38000 mi Fuel line leak. 101900 mi Catalytic converter replaced. US $270 Ruptured inboard CV boot on passenger side front driveshaft, was depositing grease on exhaust/cat. Driveshaft replaced. US $191 A/C found to be not working (the day before I had someone lined up to buy the car). O ring on AC Compressor found to be leaking by garage. Replaced. Car sold hours later. US $90 Plastic black door sill body cladding had top part tear and about 1 foot was dangling loose. Dealer cleaned and glued plastic trim back on. US $2200 Replaced clutch. Was still working but slipped when doing extreme acceleration ; ) Abuse related repair : p. Not Subaru's fault. Known 2002 wrx plastic radiator issue. Very slow micro leak at seam. Holds up during 1 hr pressure test but randomly leaks and makes a little stink while driving when engine is hot. Was sufficiently annoyed to finally change it. US $600 Return trip - smell of burning oil in cabin. Gaskets (head? valve cover?) were leaking and needed replacing. AC compressor declared dead... it was just repaired /recharged 2-3 months ago? Now dead...in winter, car has been sitting in driveway after purchase of new car. Dealer wants $8-900, I refused. US $400 Whine/whistle upon acceleration; AC not functioning. New AC line and belt installed. US $200 Power steering was inconsistent. Pump was replaced and system bled. US $50 Replaced wiper motor and assembly. US $100 Replaced several dry and cracked vacuum crankcase lines. US $50 Replaced turbo coolant supply line. Coolant flushed. US $200 Replaced turbo oil return line. Including exhaust gaskets for: manifold, collector, up pipe, turbo, down pipe. US $140 Trip Check. Fluids topped off, tires rotated, brakes checked. Ready for blue ridge. 52080 mi Whining sound from 3rd gear at steady speed or on deceleration. Replaced transmission under warranty. C $1200 Clutch replaced with Exedy competition Stage I as the stock clutch which was replaced at 54,000 kms was slipping. US $730 Cracked radiator Replaced cracked radiator. US $113 Check Engine light came on. Dealer determined it was because intake boot wasn't properly secured, causing unmetered air to enter intake. NOTE: this was not the problem as the Check Engine light came on again 9 days later! Motor oil cooler gasket not sealing, causing engine oil leak. Replaced left side valve cover gasket. This repair was an additional $393. US $525 Air intake sensor intermittently giving incorrect reading, causing computer to think fuel was running too lean. Check Engine light on. First trip shop said intake not secured properly. Second replaced sensor. US $137 Refrigerant leak in AC--replaced. Small leak that will cost $1000 for permanent fix. US $174 Replaced high side Schrader valve. Compressor shaft shows signs of seeping. Performed full AC service. 105000 mi Strong fuel smell coming from engine compartment. Fuel rail fixed by dealer, covered by Subaru. US $900 Timing belt kit, thermostat, aftermarket catless up-pipe (factory catted one can break and kill the turbo), LWCP. US $4800 Whole Engine Replaced because of cracked piston. Also rack and pinion replaced clutch assembly and thermostat. US $45 Leaky valve cover on the passenger side caused smoke when the oil leaked on the up pipe. Replaced gasket and resealed but still seeping a small amount of oil. US $15 Oil leaking from passenger side valve cover. Replaced gasket again. US $700 Rear end squeaked over bumps. Shocks we're due for replacement. Installed new tokico d spec adjustable dampers with springs from a 2004 WRX STI. Also replaced all 4 struts mounts. The fronts were cracked. Not sure if this counts as a repair or just maintenance. US $310 Radiator replaced due to a crack in the top. 106000 mi Throwout bearing was making noise for about a year, dealer confirmed diagnosis at the 105k service and recommended clutch replacement. Squealing from AC compressor. Dealer advised AC clutch/bearing failing. Waiting until warmer weather to repair (belt removed). 12000 mi Clutch shudder at cold start. Whole clutch/disc assembly replaced under warranty. 30000 mi Check engine light. ECU reflashed by manufacturer under warranty. US $185 Coolant hoses leak Coolant hoses leak. Replaced. US $135 Subaru recall # WVK-21. Strong fuel smell under the hood during cold morning startups, lasting more than 5 minutes. Two gaskets on engine replaced; as recommended by dealer service manager. Replaced two engine gaskets. Subaru recall # WVK-21. Strong fuel smell under the hood during cold morning startups, lasting more than 5 minutes. Fixed under warranty. US $1200 Mechanic misdiagnosed crank sensor problem and replaced clutch system first instead. Mechanic misdiagnosed crank sensor problem and replaced clutch system first instead. US $160 Radiator leak. Need to add coolant every month. Replaced corroded battery tie-down with aftermarket aluminum one. Dealer found the water leak in trunk. One area of chassis weld has split apart. Dealer said unable to fix. I sealed the split weld line myself. 96250 mi Radiator leak. Buyer replaced it. C $150 The prestone reservoir started leaking too much (it was leaking before) and I had it replaced. The replacement was plastic instead of metal, which efectively solves the corrosion problem the older one had. C $300 I had to replace the whole window linkage and electric motor on the passengers side window. C $240 Gas odor inside the car which happens at low temperatures was fixed, will have to wait until low temps to see if problem comes again. C $300 Had hesitation when giving gas. Diagnosis was a bad MAF, which I ordered seperately and installed myself. MAF replaced, runs like new. C $160 IAC gunked up and needed cleaning. Was causing misfires. C $100 Blown radiator, replaced radiator. C $600 Battery was constantly dead, alternator was replaced with a used unit as the old one was'nt outputtiong enough voltage. All connectors from the alternator to the battery were cleaned. Oil return tube was slightly leaking but the oil entered and fouled a coil pack. Coil pack had to be replaced with a new unit and oil return tube replaced. C $300 Radiator leaking, replaced with all aluminum radiator. A/C compressor strap went straight through timing belt cover. Will have to replace timing belt cover, A/C strap and pulley. C $300 Replaced AC belt and timing belt covers. C $40 Voltage drop problems when using A/C, defrost, etc. Tried improving grounding and cleaning connections, did not work. C $30 Vibration in steering wheel. Replaced an engine mount bolt that was missing, probably from some previous repair. Eliminated a squeaking noise, but vibration in steering still present. C $600 Rear left suspension top mount was worn and doing clunking noise. Replaced top mount. 68000 mi After the car warms up (30+ mins of driving), the car clunks when performing low-speed turning. US $1400 Prior problem as selected above: After the car warms up (30+ mins of driving), the car clunks when performing low-speed turning. US $50 Leaking radiator; radiator was repaired a little over a year ago by auto insurance company's repair shop after a front end collision. Because defective part was originally repaired, it was covered under insurance company's warranty. US $30 Broken sway bar end link. Simply installed a new one. US $290 CV Boot torn. US $32 Leaking radiator hose. US $1500 Burnt valve. Replaced all valves. US $100 Connection between pipes broke and needed to be re-welded. US $1980 Head gaskets replaced under warranty. Timing belt, brake rotors and pads, plugs, all fluids replaced, suspension pin. US $500 Replace wheel bearings on passenger rear . US $2500 Replace Headgaskets & rebuilt heads. US $300 Head gasket failure. Replaced oil pump, water pump and headgaskets while disassembled. US $85 Replaced faulty knock sensor after error indicated by check engine light. US $500 Had to get air conditioner replaced. Condenser went out, along with belt and everything else. Mar 2009 Returned four days after purchase because dealer didn't disclose salvage title at time of sale. One head gasket slightly sweating at the time. Also a slight leak in a rubber seal on the transmission. It was minor enough that mechanic recommended just waiting until the clutch needed replacing and regularly checking transmission fluid levels. C $1400 Right rear strut oil leaked out and required replacement of both right and left rear struts. US $3000 Needed a new CV joint Replaced catalytic converter Knock sensor replaced Spark plugs and engine working coil replaced. Coil had failed and was sparking to ground causing engine to surge erratically. 117000 mi A.C. compressor broken. Not repaired at time. New belt routed to skip compressor. C $500 Stalling and hesitation which was cured with new oxygen sensor - routine maintenance at this mileage (190000)? Note. Total bill for two problems was $1400, it seemed like $500 for oxygen sensor and $900 for new shocks on the rear of the car - again could be routine maintenance for a car with 190000 kms. 40000 mi Water pump broke. Had to get a new one. US $800 Timing belt worn and replace belts. US $400 rack bushings replaced, steering realigned, tires balanced; purchased car knowing these repairs would be needed. US $1700 Replaces timing belt, clutch, water pump and AC fan belt. 92000 mi Loose stay in drive train. US $1400 Muffler and catalytic converter replaced. US $170 Replaced evaporative vent valve. US $50 Rattling heat shield removed. Not replaced. US $1208 Right front lower control arm broke while on the road. Replaced conrol arm, suspension link and rust-riddled front subframe. US $990 Exhaust pipe and catalytic converter connections rusted almost to breaking point. US $459 Left side lower control arm broke. Replaced same. Right side lower control arm and front subframe broke January 2011. Subaru denies any responsibility. US $2000 Headgasket replacement, water pump change. US $300 Spark Plugs. Wires. Ignition Coil pack for #2 cylinder. Map Sensor. US $250 Clutch release bearing failure. Changed clutch also just because it was apart. 103100 mi Had to replace the front pass cv joint. US $200 gasoline smell. tightened parts. US $346 Both cats replaced, got rid of 420 code (rear o2 sensor). Also mid pipe replaced due to rust holes at bracket points. 193000 mi road salt caused lower control arms to rust. recall. US $100 Front universal joint on the rear driveshaft was worn out. US $4500 Head gaskets 2nd time. Once at 30K now again. Brakes (rotors, wheel kits, pads), ball joints, timing belt, struts, knock sensor 3rd time, fuel filter and fluid maint. There is a computer problem, but haven't been able to find it. 108000 mi Left rear wheel cylinder locked up. Freed, has not repeated yet. 111000 mi Shop did not fix brakes. I replaced LR wheel cylinder, brake hose, RR adjuster. Still waiting to see if LR wheel lock up solved by cylinder and hose replacement. ABS still acting up some, but neither I nor the shop can find a problem. US $114 Based on dealer computer, replaced rt rear speed sensor. Still not fixed, and no one yet knows what is wrong. Will take to different shop on 1/6 since I, nor anyone else yet, can fix it. US $90 Still rt rear ABS problem. Everything was cleaned and it helped some, but not fixed. To fix will cost more than I want to spend. US $40 Overheating, misfiring on cylinder 3. Time for head gasket number 4. Which I'll have to do later. Made temp repairs for now. Will correct later. US $350 Air conditioning blowing hot. Freon recharged. 82000 mi I have a slow head gasket leak they are doing nothing about at this time. US $273 air conditioning was not working (was last repaired last year - freon was recharged). but within the week of the repair, could hear a hissing sound when air cond. was running and am now taking it back because it is blowing warm air again. 87000 mi Would cost $1,100 to fix the A/C, so didn't fix. US $300 Compressor, receiver and dryer failed, shop replaced these to repair the air conditioning problem (was not blowing cold), but the A/C was insufficiently cold from day two after getting the car back. Upon putting dye in and checking system, found that there were additional leaks. Fixed those and charged for parts, no labor, no freon (which were required) given that the issue had not been found previously. 3rd attempt to fix the A/C. Told me that there was a "high pressure hose" that was leaking in addition to the previous defective compressor, dryer, receiver (trip #1), and two additional leaks (trip #2). So far so good, but took three recent trips. US $75 Car had exhuast crack that was repaired. Needed new timing belt and water pump in 3000 miles, needed some other maintenance/repairs over next 5000 miles so decided to sell. See our lemon odds and nada odds page to see vehicles with no repairs or vehicles with more than three repairs. To see how frequently 2002 Subaru Impreza / WRX / Outback Sport problems occur, check out our car reliability stats.